What would Mrs. Nast Think? 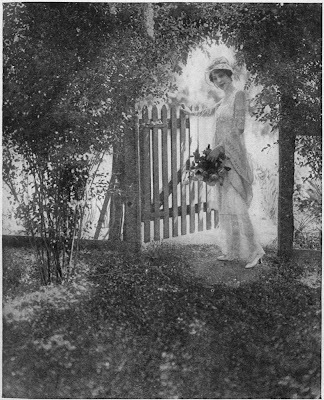 If Mrs. Condé Montrose Nast (Clarisse) was alive today, what would she, who seems so happy and at home in this filmy backlit garden portrait, think about the fact that the huge lifestyle purveyor that her husband founded in 1909 no longer publishes a magazine that reports on the world of gardens—at all. House and Garden? R.I.P. at the grand old age of 106 in 2007. Domino? R.I.P., still a toddler at almost four in 2009. Meanwhile Architectural Digest lumbers on, seemingly allergic to any home that shows a leaf, much less any sign of life. "According to results of the recently completed 2007 National Gardening Survey retail sales of lawn and garden products to consumers totaled $35.102 billion last year. That was an increase of 3 percent or $1.025 billion more than the $34.077 billion consumers spent on lawn and garden products in 2006." What a sad state of affairs in the magazine biz that the publishers can't work with these numbers. If anyone knows what variety of bromeliad/pineapple this is, please let me know. P.S. The ornate ceramic topiary at the left is "Constance with Flowers" from my friends James and David at Klein Reid. I never got the chance to see Thalassa Cruso (1909-1997) on television. 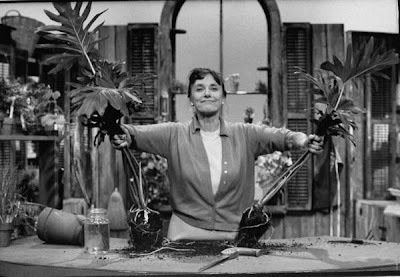 Known as the "Julia Child of Horticulture", she starred on her own weekly public television show "Making Things Grow" from 1966 to 1969. I would have been only four when her show went off the air, so I'm not surprised that she couldn't divert my attention from Captain Kangaroo. However my mother, a bit of a houseplant doyenne herself, kept Making Things Grow: A Practical Guide for the Indoor Gardener close at hand as her favorite. When I started gardening in earnest decades later, it was this very same book filled with mom's underlining and notations in the margins that I purloined on a trip home. Over the years, I've continually turned to it for advice on how to succeed with houseplants in my New York City apartment. I get the benefit of expert tips from two houseplant experts, Thalassa and my mom, that are as fresh and pertinent as the day they were written. Like Julia Child, Thalassa's books were published by Knopf but unlike those by her more famous colleague, are now unfortunately out-of-print. Her most popular titles are inexpensive and easy to find on abebooks or alibris. Support your small bookseller and buy a whole set. You won't be disappointed. 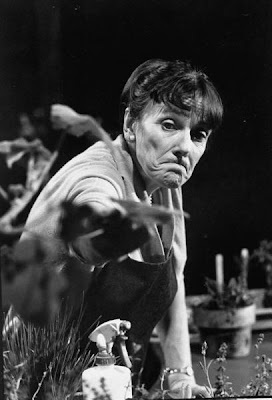 Click here to read my New York Times Q&A quoting Thalassa on houseplants. Aren't you tired of those big fat overbred varieties of amaryllis? Thanks to the hybridizers, not only are they starting to look more and more vegetal instead of floral, with their thick oversized flowers, the plants have the bad habit of tipping over and crashing to ground—pot and all—as soon as they come into bloom. But this white Trumpet Amaryllis 'Amputo' from Van Engelen has ridged, paper-thin petals with delicate wavy edges. It's also slightly fragrant which is a trait I haven't experienced in an amaryllis since I was a kid. Put it on your list for next year? The Sycamore or plane tree (Platanus occidentalis) seems to possess a talent for absorbing nearby objects like sidewalk pavers, railings and bits of masonry. This metal sign, whose useful days seem to be numbered, is on the block below my apartment in Jackson Heights, Queens. Go here to see a gallery of object-absorbing trees of all sorts on a German website. Go here to see a nice painting of menacing plane trees by Van Gogh.